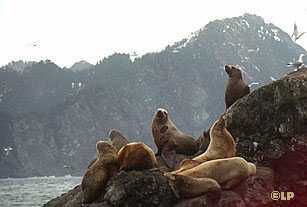 Steller sea lions laze on a rocky shore in Resurrection Bay near Seward. 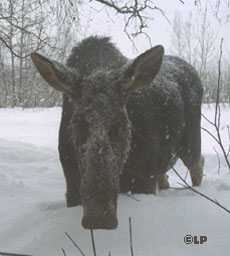 You may go days - weeks even - without seeing any and then, unexpectedly, there it is: Alaskan wildlife in your face! I encountered the moose at right simply by looking out my living room window. No telephoto lens involved here; a wide angle was required for that shot. Summer visitors who search for wildlife in Alaska are almost always rewarded, but the search often takes some effort. The sea lion photos on this page were taken on a day cruise from Seward. The cruise was promoted as an opportunity to see gray whales migrating along the Pacific Coast - but no gray whales were sighted. 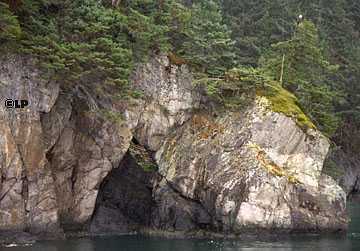 The Resurrection Bay cruises are one of the best bets for seeing wildlife, especially sea lions and sea otters. Eagles may be sighted, too, as white dots in the tree tops. There's an eagle in the photo below. See it? But it doesn't always take a special trip. An eagle roosted for weeks early one recent spring on a tree in my neighborhood. And they're as thick as sparrows on the spit in Homer, Alaska, during the winter. That's where the photo, below right, was taken. 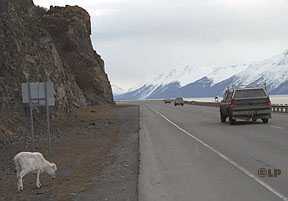 Tourists driving south from Anchorage to Seward or Homer are well advised to keep an eye during the first few miles for the Dall sheep that can sometimes be seen high on the rocky slopes. Even blase Alaskans are inclined to slow down on the infrequent occasions when the sheep venture as close to the highway as this. Again, no telephoto lens was needed for these shots. I've seen a fox in a parking lot and dodged moose on bike trails. In the late 1980s, a grizzly bear that had wandered into Anchorage (a city of 260,000 intrepid souls) was shot near a school playground. A wildlife biologist estimated in February 1999 that 200 black bears and 60 brown bears were living in the area that includes Anchorage, Eagle River, Girdwood and Chugach State Park. In Alaska, if you can't find the wildlife, the wildlife may find you.